Many organizations are considering HEVC when building specifications for video backhaul projects. 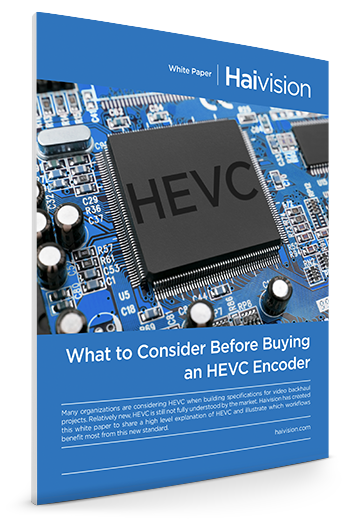 Relatively new, HEVC is still not fully understood by the market. Haivision has created this white paper to share a high level explanation of HEVC and illustrate which workflows benefit most from this new standard. Video streaming is responsible for most internet traffic, and they will continue to drive bandwidth requirements into the foreseeable future. When considering adding HEVC as a requirement for a video project, first consider the application and cost of bandwidth/networking. If any type of backhaul over expensive, managed connections is required, then HEVC can provide a significant OPEX savings.